DISGRACED Discussed with Ayad Akhtar and Josh Radnor. Free book talk and signing. January 22, 2015 at 5:00 p.m.
Ayad Akhtar’s Disgraced is currently running on Broadway at the Lyceum Theatre through March 1. His plays include Disgraced (Broadway/LCT3/Lincoln Center Theater, 2013 Pulitzer Prize for Drama/2013 Obie Award for Extraordinary Achievement/2103 Jeff Award for New Work), The Who & The What (LCT3/Lincoln Center Theater and La Jolla Playhouse), and The Invisible Hand (New York Theatre Workshop/The Repertory Theater of St. Louis). Also a novelist, Akhtar is the author of American dervish, published in 2012 by Little, Brown and Company, published in 20 languages worldwide. He co-wrote and starred in The War Within (Magnolia Pictures), which was released internationally and nominated for an Independent Spirit Award for Best Screenplay. As an actor, Akhtar also starred as Neel Kashkari in HBO’s adaptation of Andrew Ross Sorkin’s book Too Big to Fail. He studied at Brown University and Columbia University’s School of the Arts. Josh Radnor wrote, directed, and starred in two films, both of which premiered at the Sundance Film Festival before being released in theaters: The Audience Award-winning happythankyoumoreplease opposite Kate Mara, Malin Akerman, and Tony Hale and Liberal Arts opposite Elizabeth Olsen, Richard Jenkins, Allison Janney, and Zac Efron. He was last seen in Jill Soloway’s Afternoon Delight (Sundance, 2013) opposite Kathryn Hahn and Juno Temple. Recently finished a nine-season run playing Ted Mosby on CBS's Emmy-nominated comedy How I Met Your Mother. His other television credits include guest appearances on ER, Six Feet Under, and Law & Order among others. He was a series regular on ABC's The Court starring Sally Field. He made his film debut in the original teen spoof Not Another Teen Movie. On Broadway he played the title character in The Graduate opposite Kathleen Turner. Off-Broadway and regionally, he has appeared at the Manhattan Theater Club, The Vineyard Theater, and Baltimore Center Stage, among others. In Los Angeles, he appeared in the Ovation Award-winning world premiere production of Jon Robin Baitz's The Paris Letter. Most recently Josh appeared in New York Stage and Film’s world premiere production of Richard Greenberg's The Babylon Line, directed by Terry Kinney. Meet the playwright! Come to Warwick's "green room" where you can have the chance to meet Pulitzer Prize-winning playwright Ayad Akhtar. Warwick's, in partnership with La Jolla Playhouse will be hosting Mr. Akhtar as he discusses his world premiere play The Who & The What and signs his novel American dervish. This is your chance to meet with the award-winning playwright in a fun and intimate setting. Reserved Seating is available. Everyone who purchases a Reserved Seat will receive a promo code for 20% off the cost of The Who & The What at the La Jolla Playhouse. Please call the Warwick's Book Dept. (858) 454-0347 for details. Mr. Akhtar's play The Who & The What is having its world premiere at the La Jolla Playhouse February 11th through March 9th. Click here to learn more. *Must be present at the Ayad Akhtar event in order to win. Join us for a reading group discussion of Disgraced by Ayad Akhtar! A social drama depicting racial prejudices among cultural groups living in Upper East Side, New York. Diesel, A Bookstore in Oakland welcomes The Diesel Readers back to the store to discuss American dervish by Ayad Akhtar on Monday, August 19th at 7 pm. Hayat Shah is a young American in love for the first time. Mina is Hayat's mother's oldest friend from Pakistan. She is independent, beautiful and intelligent, and arrives on the Shah's doorstep when her disastrous marriage in Pakistan disintegrates. Her deep spirituality brings the family's Muslim faith to life in a way that resonates with Hayat as nothing has before. Studying the Quran by Mina's side and basking in the glow of her attention, he feels an entirely new purpose mingled with a growing infatuation for his teacher. When Mina meets and begins dating a man, Hayat is confused by his feelings of betrayal. His growing passions, both spiritual and romantic, force him to question all that he has come to believe is true. Just as Mina finds happiness, Hayat is compelled to act — with devastating consequences for all those he loves most. The book club for readers between the ages of 19 and 35. Join the Popular Reading Library for stimulating book discussion and fun. Registration begins on July 7 at the Level 2 information desk. The Desi Lit Book Group meets at 7:30 p.m. to discuss American dervish by Ayad Akhtar. 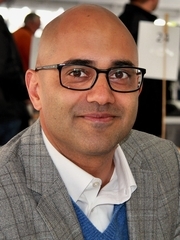 Ayad Akhtar is currently considered a "single author." If one or more works are by a distinct, homonymous authors, go ahead and split the author. Ayad Akhtar is composed of 3 names. You can examine and separate out names.